Dance teachers are the focus of this month’s Dancing Times, which includes interviews with ballet teachers Carlos Valcárcel, now head of dance at English National Ballet School, and the Greek-born Christiana Stefanou, who travels the world teaching at a number of prestigious ballet companies. In addition, regular contributor Phil Meacham considers the impact Brexit (don’t groan!) may have on ballroom and Latin American teachers and studios based in the UK. 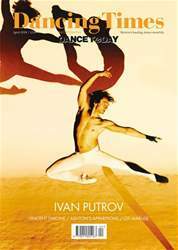 In addition, we talk to Ivan Putrov, the former principal with The Royal Ballet who is launching a new show focused on the male dancer at the London Coliseum, and Vincent Simone, the former Strictly Come Dancing favourite, who is about to embark on a UK tour alongside Ian Waite. Stage design is also featured in this month’s magazine, with an interview with veteran designer Jürgen Rose, currently working on a new production of Kenneth MacMillan’s Mayerling for the Stuttgart Ballet, and a preview of an exhibition in Cardiff of designs for The Royal Ballet’s production of Swan Lake by John Macfarlane.